Purchased from Auto Air and Audio in 2001 at 717 West Sunshine "2-Blocks west of Bass Pro". This store just underwent a major million dollar expansion and renovation, completed in 2009, and is in the process of further renovation, with new sound rooms, a new exterior, and new state-of-the-art installation facility! 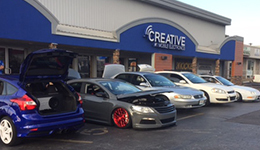 Our whole Creative team are specialists in car audio, OEM integration, marine audio, and vehicle restyling.